The beginning of a new year means it is almost time for one of our most delicious fundraising campaigns (a definite favorite among our Foundation staff). Starting February 1st, the countdown to National Pancake Day at IHOP begins! This year’s National Pancake Day will be March 7th, but you have an opportunity to support the campaign for 5 weeks from 2/1/17 – 3/7/17. Stop by IHOP in Salinas or Capitola and purchase a Miracle Balloon for a donation of only $1. If you’re a regular IHOP customer like we are, you might consider making a $5 donation – it comes with a $5 off coupon good on your next visit. It’s a win-win! Last year, one local IHOP regular came up with a great way to support the fundraiser during his daily visit for coffee and pancakes. Every day he’d donate $5 and get the $5 coupon in return. He’d donate, then come back the next day, pay with the coupon, donate another $5, receive another $5 coupon… you get the idea. Every dollar adds up, and this gentleman ended up donating over $100 over the course of the campaign. Wow! 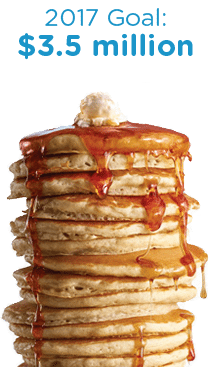 On National Pancake Day, IHOP will be giving away a free* short stack of buttermilk pancakes to every customer to celebrate, and in return for the pancakes, we hope that you’ll consider making a donation to our local CMN Hospitals Program. We’re grateful for the support of IHOP and all of the IHOP customers that make this annual campaign such a success. Previous post: Top 16 Moments from 2016!